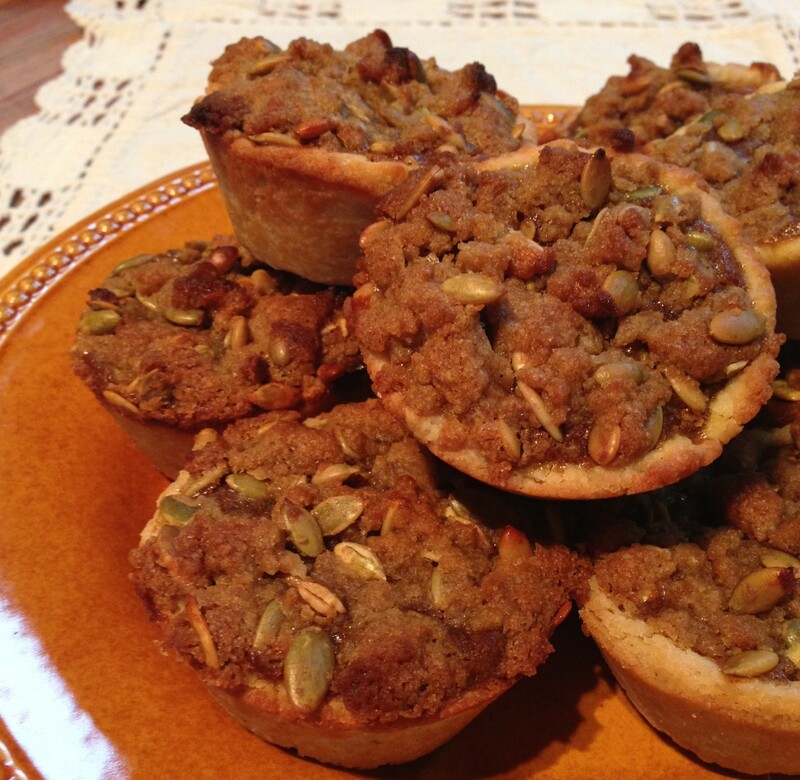 Can you make a butter tart taste like a pumpkin pie? Yes! These tarts evolved from basic butter tarts, but they’ve come so far that they’re really more like little mini pumpkin pies. But does it really matter where they came from? It’s where they’re heading that counts. In this case, your table! Preheat your oven 450 °F and turn on your convection fan if you have one. Lightly oil a standard muffin pan. First make the pastry. In a large bowl whisk together the flour, sugar, nutmeg, and salt, evenly distributing the finer powders amidst the coarser ones. Grasp the butter and firmly grate it through the large holes of a box grater into the flour below. Working quickly, toss the flour and butter shards together with your fingers until the fat is evenly distributed throughout the flour. The cold, separate pieces will yield dividends in flavour and texture as the butter creates flaky layers of pastry. Sprinkle the ice water into the works and stir into a dough mass with the handle of a wooden spoon. If there’s a lot of flour leftover in the bowl and it’s not coming together, add a little bit more ice water, a tablespoon at a time, until it does. Working quickly so the heat of your hands doesn’t melt the butter, knead the works a few times until the dough gathers up all the flour in the bowl. Fold it over a few more times to add a bit more strength to the dough and a few more flaky layers to the pastry. Flour your hands, the dough, the work surface, and a rolling pin. Roll the pastry out into a circle about 15 inches (38 cm) wide and 1/4 inch (5 mm) thick. Using a 3 1/2-inch (9 cm) cookie cutter (or an empty 19-ounce/540 mL can with both ends removed, or the ring from a wide-mouth canning jar), cut circles from the pastry, as many as you can. Form a pleat along one side and fit the pastry into the muffin cups, evenly filling each cup right to the rim. Gather up the remaining dough, roll out, and repeat. Next, craft the filling. In a large bowl, combine the pumpkin, eggs, sugar, butter, vanilla, flour, ginger, nutmeg, cinnamon, allspice, and cloves. Whisk together until smooth. Evenly fill the pastry shells. Make the crumble topping. In a medium bowl, use your fingers to toss together the flour, pumpkin seeds, and brown sugar. Drizzle with the butter and mix the works evenly until a light, crumbly topping forms. Top each tart with its fair share. Bake until the pastry is beautifully browned and the filling cooks through and puffs slightly, about 20 minutes. Cool slightly until you can remove the tars from the pan. Serve and share! I’m a FoodTV host, cookbook author and official food ambassador for Prince Edward Island, more importantly I’m a Dad and passionate home cook! 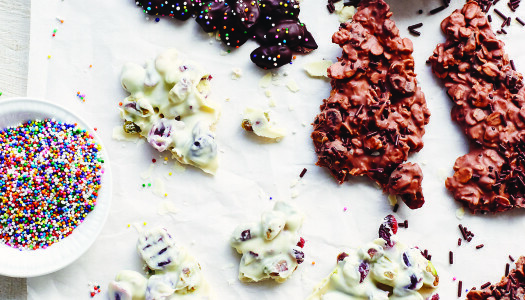 You can easily make your own homemade chocolate treats. It's deliciously easy to stir a variety of crispy, crunchy bits into a warm pool of melted chocolate, cool and harden the works, then start snapping off homemade candy! Cocoa powder gives chocolate its rich flavour and makes this steaming mug of hot cocoa my favourite winter treat. A touch of cayenne pepper balances the temperature heat of the brew but doesn’t make it too spicy. It’s a surprising twist that adds just the right exotic edge.